Our organization is one of the most preferred manufacturer and supplier of differentNursing Manikins. These manikins are given almost the same looks as of a real person for several nurse training purposes. We have products like Advanced Adult CPR Training Manikin, Wound Care Manikin (Male), Advanced Nursing Baby Manikin etc. under this category. Used in various medical institutes and colleges, these manikins are highly useful for nursing studies. Clients can avail these real lookingNursing Manikinsfrom us in both bulk and small numbers at industry leading rates. • The AED Trainer with Replaceable Language/Scenario Card is designed toeffectively train emergency responder in the use of an Automated ExternalDefibrillator (AED). 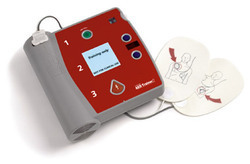 This training unit provides a variety of pre-programmmedscenarios to help responders become familiar with an AED and allow them todemonstrate the basic skills necessary to use an AED in an emergency.• AED Trainer provides simulated shock delivery. It has no high-voltagecapabilities, and cannot deliver a shock, thereby ensuring safety duringtraining. Looking for Nursing lab ?